Note: Do not read this if you care about spoilers for a 20 minute demo just go and play it yourself. It’s free. With this in mind I would say the Platinum Demo succeeds in a way that Episode Duscae before it could not. Due to its length it allowed it to be an entertaining side adventure you could experience rather then actually grind away at. Strangely enough calling it a demo doesn’t really work all that well. As its very much more a little side story or interlude, just without the main presentation yet ready. In this sense Episode Duscae remains without any doubt the premier vehicle for getting a strong feeling for Final Fantasy XV the game as a whole. That being said the short time spent with a young Noctis and Carbuncle his faithful companion isn’t a waste, no far from it. As in the months since the update to Episode Duscae there have been many changes to Final Fantasy XV’s core mechanics especially in the battle system. While not really a challenge Platinum Demo gives players a very good feel for the battle system by slowing it down slightly. Personally I would have to say it performs much better then it did previously, although again that is just my personal opinion. Even if it does have a distinct feeling of Kingdom Hearts to it, more so then in Episode Duscae certainly. By holding down buttons to attack and dodge automatically it removes a lot of the tedious button mashing plaguing many other Action RPG’s on the market today. Without separating the player from the action something Final Fantasy XII and XIII would often do. Furthermore by binding the various weapons to the directional pad you can change weapons on the fly allowing for more variety in combo’s and attack patterns. You can even transform into monster forms to fight, a very fun addition to the demo. The whole affair feels very polished and I expect will be more then capable of carrying the supposed fifty hour playtime of the main campaign. Pretty nice vistas, not going to lie I stopped to check them out a few times. Of course not all is great. Ranged weapons and magic while powerful seem a little too cumbersome to use properly, at least in the demo. Which is strange as in Episode Duscae they were fine. I’m not convinced this is a flaw in the system though, it’s likely the fact I just adore the close combat of the game which made me less inclined to use them properly. I expect this will require more exposure then Platinum Demo could provide to really be determined. As a dream of a child the tone of the demo is much more whimsical then your standard Final Fantasy game. There is even one stage where you are shrunk down to the size of an ant and must find your way to the top of a kitchen table. In a scene very much reminiscent of Lewis Carol and yes Kingdom Hearts. However the environments are gorgeous, the forest and urban area’s especially are quite nice to look at. If Square is good at anything it’s making games look damn good. The ending stage is especially noteworthy not only because it allows you to fight an Iron Giant as the Demo’s main boss, but it takes you to a location we haven’t seen in a while. The Citadel, the location of the Final Fantasy Versus XIII E3 2006 Trailer... yup it may have taken a decade but we finally made it in some form. I’m not sure if I should laugh or cry at that statement but here we are. 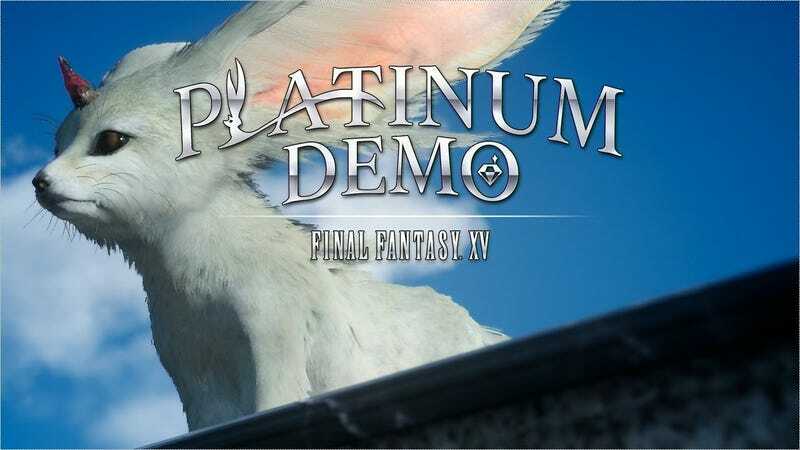 At the end of the day there really isn’t much more to say about Platinum Demo. It is an intriguing little glimpse into Final Fantasy XV now less then six months away and for fans who are actually excited about the game a must play. Really what do you have to lose it’s only twenty minutes and you get a cute furry friend at the end of it all.